We've all had the experience- watching a political debate (photo from Reuters/Mike Segar), listening to the "color analyst" for an athletic event, even reading a review of a favorite television program or movie- and wondering: did she watch the same thing I did? Fireworks flying in their first one-on-one debate...it was Clinton who was the main aggressor, saying Sanders could never achieve his ambitious and costly proposals. Then she took after the Vermont senator for his efforts to cast her as beholden to Wall Street interests because of the campaign donations and speaking fees she's accepted from the financial sector. "Artful smear" was, admittedly, a smear, something of a cheap shot. 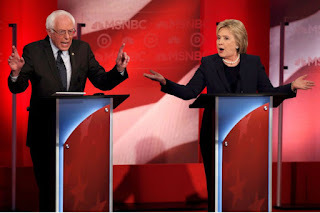 And when Clinton charged "So I think it's time to end the very artful smear that you and your campaign have been carrying out...," some cross-talk followed, after which Sanders shot back with the vicious "Let's talk -- let's talk about issues, all right? " Sanders, for his part, suggested Clinton's loyalties were colored by a reliance on big corporate donors. "Secretary Clinton does represent the establishment," he said. "I represent - I hope - ordinary Americans." Clinton may say the right things, he suggested, but "one of the things we should do is not only talk the talk but walk the walk." Sanders added that he is "very proud to have people like Keith Ellison and Raul Grijalva in the House, the co-chairmen of the House Progressive Caucus" (supporting him). Clinton thus was handed the opportunity to suggest that Sanders has garnered the support of only two of the 188 Democratic members of the US House of Representatives, zero (0) Senators, and zero (0) governors because he is out of the mainstream or that the governors and members of Congress, from nearly every other state, who have endorsed her are afraid Sanders cannot carry their state in November. Instead, she insisted "Well, look, I've got to just jump in here because, honestly, Senator Sanders is the only person who I think would characterize me, a woman running to be the first woman president, as exemplifying the establishment. And I've got to tell you that it is... " It was a positive statement, albeit one that does not mean she does not represent the Establishment. Consider that Sanders has assiduously avoided the e-mail scandal, the nexus between Clinton's service as Secretary of State and the Clinton Global Initiative, or her response to her husband's philandering, which the GOP recently tried to exploit. Instead, he has criticized his opponent for: a bias toward "free" trade; an ambiguous relationship to Wall Street; not being a "progressive;" voting to give President Bush a blank check in Iraq; insufficient enthusiasm for universal health care. If Clinton is the nominee, the GOP- with its ideological bent- would be hard pressed to turn any of that into a sound bite or a damaging video. The "fireworks" in the debate presumably did not include the following remarks by Sanders: "Secretary Clinton is absolutely right, there ar people, Koch brothers among others..."; "O.K. Let me argue with much of what the Secretary said..."' And I would say if I might, Madame Secretary- and you can correct me if I'm wrong"; "I fully, fully concede that Secretary Clinton, who was Secretary of State for four years, has more experience- that is not arguable- in foreign affairs." In return (sort of), when Mrs. Clinton was asked if she wished to respond to Sanders' claim that an ad implying a New Hampshire newspaper (which had taken no position) had endorsed him, and which was entitled "Endorsement," Clinton replied "no." It was a response as generous as it was brief, which is itself a welcome departure from the norm for a politican (or a celebrity). Admittedly, Clinton must- not strategically, but from a sense of decency- drop the claim that the Vermont Senator proposes that as President he would rescind the Affordable Care Act while endeavoring to institute single payer. It is a preposterous claim, intended to raise the hair on the back of the head of Obama Stepfords unaware that a President Sanders would maintain the current system while trying to improve or replace it. Still, Clinton was civil to her opponent, at one point acknowledging "I have great great respect for Senator Sanders' commitment to trying to restore Glass-Steagall." And when the debate ended and Rachel Maddow, exhibiting a remarkable lack of professionalism and inferring a bias toward the Democratic candidates, hugged both Hillary Clinton and Bernie Sanders, it was a fitting end to a relatively informative and cordial encounter.